Drew Angerer/Getty ImagesA supporter holds cut-outs of Conor Lamb’s face. Democratic strategists say Conor Lamb’s upset victory in Pennsylvania this week shows that the party should run authentic candidates who fit their districts, rather than the national party line. Lamb’s narrow win, they say, is proof that Democrats can and should run everywhere. 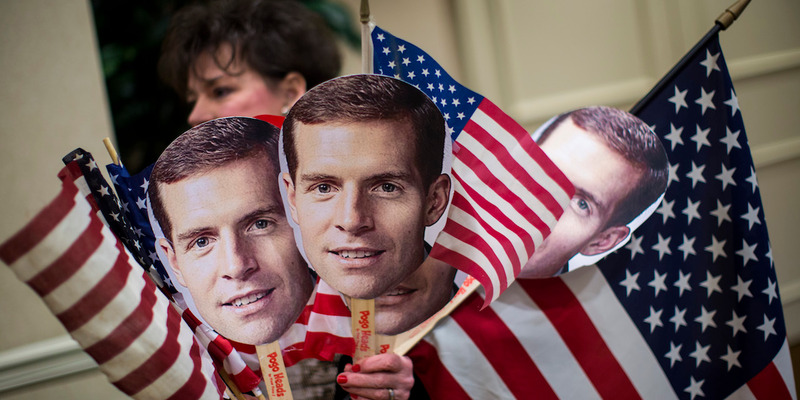 Following Democrat Conor Lamb’s victory in a western Pennsylvania congressional district that President Donald Trump won by 20 points in 2016, Democrats are mining the race for clues on how to replicate his success across the country this year. There are somewhere north of 110 House districts that Trump won by a smaller margin than he did Pennsylvania’s 18th Congressional District, and another 23 GOP-held districts that Clinton won in 2016. Democrats need to flip just 24 seats to take the House back in November. Jesse Ferguson, a top spokesman for Hillary Clinton’s 2016 campaign, said that Lamb’s success can in large part be attributed to his authenticity. The 33-year-old former Marine and federal prosecutor was born and raised in the district – a hometown success story. Steve Schale, a top Democratic strategist based in Florida, said that Lamb’s personal connections to the district differentiate him from “generic Democrats” like Jon Ossoff, who lost his high-profile challenge in Georgia’s red sixth district last year. “Compare this to Ossoff in Georgia, who despite his strong fundraising, didn’t really have a deep connection to the district or compelling story, Lamb fit the district well,” Schale said. That authenticity also means independence from Washington and party leadership. Many Democrats say the party needs to take a “big tent” approach and give their candidates breathing room to take positions the party leadership doesn’t necessarily support. Conservative on some issues – Lamb is pro-gun, personally opposed to abortion, and refused to support a $US15 minimum wage – and liberal on many others, including health care and labour rights, Lamb appealed to a broad swath of the suburban Pittsburgh district, which has a strong union presence and more registered Democrats than Republicans. Lamb also didn’t run as a self-consciously anti-Trump candidate. He barely mentioned Trump at all. And he didn’t seek to tie himself to national Democrats – he ran on his opposition to House Minority Leader Nancy Pelosi, keeping his campaign as locally-focused as possible. Democrats across the country are competing in many more races than they have in recent years, challenging GOP incumbents who have rarely, if ever, faced a challenger from across the aisle. Lamb was the first Democrat to run in Pennsylvania’s 18th in six years. Jesse Lehrich, Clinton’s former foreign policy spokesperson, agreed. “For Democrats, this race was an affirmation that we should run everywhere, and that we have opportunities to connect with voters and make gains across demographic groups,” he told Business Insider in an email. The liberal New York Times editorial board made the same argument in the days before Lamb’s win.